OXFORD, Miss. – The University of Mississippi will observe Food Day, a nationwide celebration that focuses on the importance of improving American diets and food policies, throughout October. 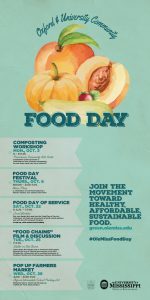 Food Day events commence with a composting workshop hosted by Sustainable Oxford at 6 p.m. Monday (Oct. 3) at the Powerhouse Community Arts Center. Campus events kick off on Thursday (Oct. 6) with the Office of Sustainability’s sixth annual Food Day Festival on the Union Plaza, highlighting food-related resources in Oxford. Set for noon-3:30 p.m., the festival features a farmers market, food samples, educational displays and other activities. This year, Food Day will incorporate a service component through the Food Day of Service, a half-day event on Oct. 22. During Food Day of Service, volunteers will complete projects affiliated with local school and community gardens and the UM Compost Program. Food Day of Service volunteer sites include gardens at the Boys and Girls Club, Oxford School District and Lafayette County Schools, plus the Oxford Community Garden and the UM Compost Program site. Volunteers will meet at 9 a.m. in the Ole Miss Student Union ballroom for a kickoff ceremony before traveling to the sites. Register to join Food Day of Service here. On Oct. 25, the Office of Sustainability will host a screening of the film “Food Chains,” followed by a guided discussion led by Catarina Passidomo, UM assistant professor of Southern studies and anthropology. The screening is set for 7 p.m. at Shelter on Van Buren. The film examines the human cost of America’s food system through the lens of tomato pickers in southern Florida, who work from 5 a.m. to 8 p.m., earning just $40 a day – a price dictated by large supermarkets. On Oct. 26, a pop-up farmers market in the parking lot of the Oxford Intermediate School will wrap up Food Day activities. The market runs from 4:30 to 6:30 p.m. and is open to the public. This year’s Food Day celebration also incorporates educational events for community children, including an activity Oct. 15 at the UM Museum’s Family Activity Day and a scavenger hunt activity for children affiliated with the Boys and Girls Club that will take place during the pop-up farmers market. The Food Day activities are organized by the UM Office of Sustainability in partnership with Sustainable Oxford. To learn more about sustainability at UM, visit http://green.olemiss.edu/.